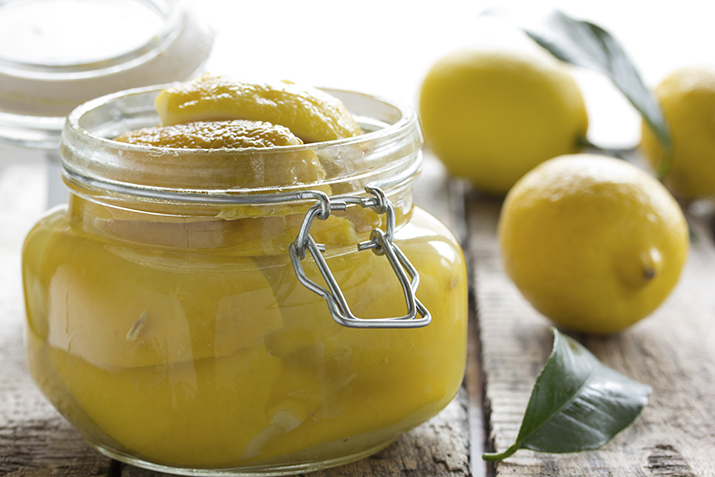 If you think a fresh lemon delivers a great flavor, you need to try a preserved lemon. The peels soften, and the fermentation adds great depth of flavor and umami. A salty, tangy flavor explosion, a jar of preserved lemons in your fridge can be your secret weapon for perking up boring foods. Try it minced into a salad, added to casseroles, even pureed into hummus. Sprinkle 2 tablespoons of salt into the jar. Prepare each lemon by slicing off just a little of the stem end and tip, then quartering each lemon lengthwise, leaving them attached at one end. As you slice each lemon, pry the quarters open and sprinkle salt inside and outside of each one, then pack into the jar. Pack them in with some force, to squeeze out some juice to fill the gaps with liquid. Once all the lemons are salted and packed in the jar, sprinkle a couple tablespoons of salt over them, then squeeze the remaining lemons, if necessary, to fill the jar with lemon juice. Screw the lid on the jar and let the jar sit out at room temperature for up to 30 days, turning it upside down occasionally to mix. Refrigerate once the skins soften. To use, take a lemon out of the jar and rinse well to remove the salty brine. If desired, use pulp, or discard. Chop remaining lemon rind for use in recipes. Save the salty lemon brine—it's delicious in small amounts in dressings, marinades or other dishes that might use lemon and salt. Hummus, tabbouleh, even pastas with greens or chicken are uplifted by a little preserved lemon and brine.